Insurance: Fully insured, $2 million dollar coverage, Certificate of Insurance with your company listed as additional insured is provided upon request $100/Per. Description: The zip line has one platform with two zip line cables, therefore you can zip line next to someone. The platform is about 35 feet off the ground, you climb up to the platform via a spiral staircase. 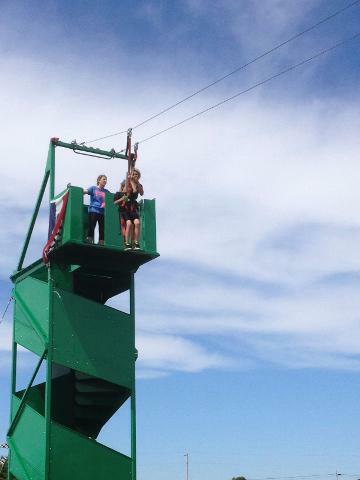 Once you reach the platform you meet your first guide and your harness is attached to the zip line cable. Once you are harnessed in your, you can zip away! When you reach the end of the zipline, you are slowly lowered to the ground via a hydraulic system controlled by the second guide. The weight limit is 40lbs to 230lbs. We can typically get ~100 zips through in an hour. Includes: Staff, travel time within 20 miles of Egg Harbor, WI during (May-Sept) set-up, insurance and 4-8 hours of zip lining. line tower is about 35ft high, vertical banners sized 4ft x 30ft can be hung on four sides of the zip line tower to advertise your company, product or event! Banners can be seen from a far distance! Q: How high is the zip line? 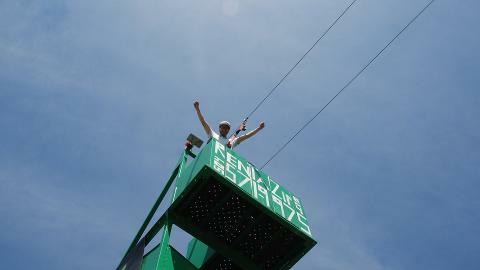 A: The zip line platform is 35ft high. Q: Are the riders harnessed in to the zip line? 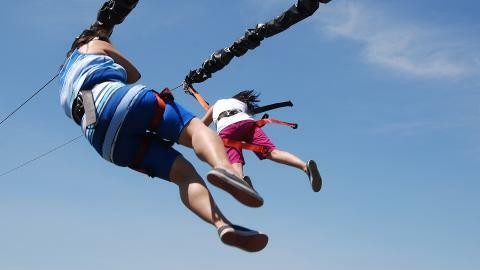 A: Yes, every rider is harnessed into the zip line with a full body harness. Q: How much space does the portable zip line require? A: We need anywhere from 120ft to 300ft long and 20ft wide to set up our zipline. 300ft is the length of a football field. Less than a 5% grade on grass, dirt, ashphalt, or cement. 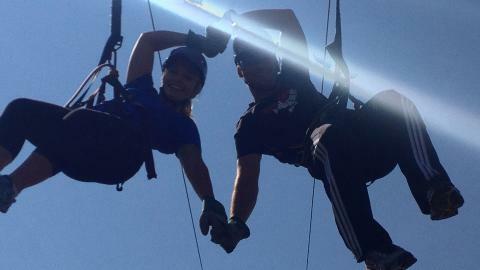 Q: Does Gravity Trails provide staff to run the zipline? 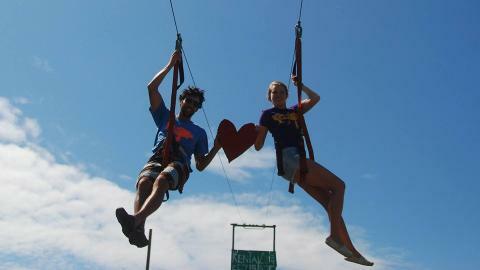 A: Yes, our experienced staff stays the entire event to run and manage the zip line. Q: Where do the zip line riders land at the end? A: Every zip line rider slows down at the end of the zip line by a hydraulic system, controlled by one of the guides, once they have reached the end each rider is unharnessed by the guide. A: Yes, Gravity Trails, LLC. carries general liability, commercial, automotive and workers compensation insurance. A: The portable zip line does not require electricity. Q: Why is the zip line so popular? 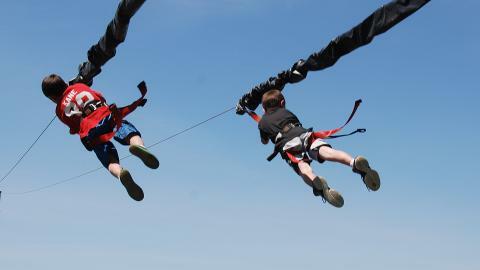 A: The portable zip line, created by Extreme Engineering, has won the last IIAMP award the last 3 years in a row! Quality and safety are not cheap. 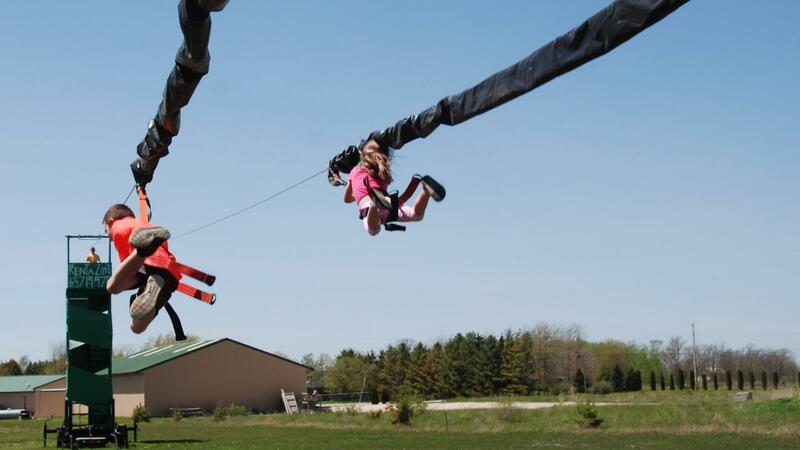 The portable zip line is the most premium party attraction available on the market today. There is nothing better! Still have additional questions? Please feel free to call us.